“The Life We Are Given is a powerful, compelling, comprehensive approach to individual transformation and community enrichment. Author Ken Wilber. “Bringing theory down to earth, learning to live the higher states we’ve talked about and intuited, George Leonard and Michael Murphy are at the cutting edge, as usual. Investigate with them the experiences of committed practice. “James Redfield—author of The Celesting Prophecy. “This book is a remarkable integration of spiritual, psychological, social nutritional, and bosy techniques to create a lifelong program of seelf transformation. There is nothing like it!” Willis W. Harman, President, Institute of Noetic Sciences. “This marvelous account of a bold experiment by a group of psychonauts bent on transforming mind, body, and spirit may well be the best outline we have of what could be called course leading to a Master’s in Transformative Practice.” Sam Keen, author of Hymns to an Unknown God and Fire in the Belly. “By combining philosophy and theory with specific instruction, Leonard and Murphy are once again pioneering at the edge between the known and the unknown in human potential.” Philip Moffitt, author of The Power to Heal. 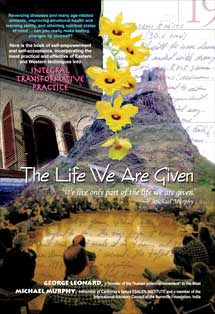 The Life We Are Given is synthesis and culmination of seventy yerars’ combined experience by two of the wisest and most pioneering explorers and teachers of the possibilities of human transformation. I recommend it highly.” Dean Ornish, M.D., President and Director, Preventive Medicine Research Institute. ISBN: 81-89658-43-3; Price: Rs. 350; Pages: 224; Size: 7.5x 9 in.